For 17-year-old Alex Wilson, life couldn't be better. Having mastered being the Princess of a magical kingdom and her real life and schoolwork, Alex finally has everything under control. The great and powerful elephant, Anala, Princess Alex's magical protector, grazes on tomatoes in the back yard — still a well-kept secret from her parents and little sister Zoe. But being the ruler of any kingdom means defending it — from without as well as within. And for the new Princess, everything is about to change. While Alex and Amanda find a new drummer (Taylor), Kuru runs into trouble from a gang in West Manjipoor. Alex comes to help Kuru and meets his childhood friends, Caleb and Zamira. When the gang won't leave Kuru alone, he finds himself at The Elephant Temple Ruins, where a strange visual disturbance ignites. Caleb and Alex help Kuru against the gang but when the visual disturbance turns into a black hole, unexplained forces fire up. The black hole starts sucking in anything it can — leaves, dust, even some of the gang members! Alex gestures at the heart of the shimmer and the disturbance disappears. Alex, Caleb and Kuru leave, unaware that the disturbance reappears and has stabilised. Zamira has seen everything and explains to Caleb that these ruins are actually the tomb of Dark Magic. Dark tendrils of smoke emanate from the shimmer and reveal... DIVA! What have they done? Notes: the "ands" listed above are credited in every episode (but don't necessarily appear) and won't repeated for subsequent episodes. As a whole, the cast credits aren't particularly accurate so I've crossed out the actor who don't appear. Alex, Amanda and Taylor are really coming together as a band, so they put a demo CD together and score the hottest gig in town, at the Canal Club. But Taylor still mixes the sound for his girlfriend's (Veronica) band, and she doesn't like sharing. After Veronica tries to steal their gig, the club manager decides the bands should battle it out to win the spot. Veronica gives Taylor an ultimatum — if he plays with Alex and Amanda, their relationship is over. Will he choose to play drums in a band and lose his girlfriend, or mix the sound for his girlfriend's band? 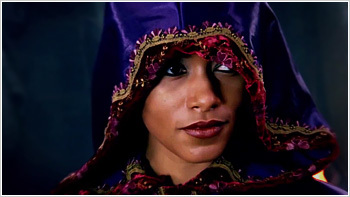 Playing on their unfortunate circumstances, their family's chequered history with Dark Magic, and her disregard for the Royal Family, Diva recruits Zamira and Caleb into her quest for Dark Magic and revenge on Alex. But Caleb isn't so sure about this. When Caleb comes to the palace looking for work, Alex is glad to see him. Kuru isn't, and assigns him the role of Royal Elephant Washer. The chemistry between Alex and Caleb is palpable, but Kuru is very suspicious of him. Upon instruction from Diva, Caleb gets Alex out of the palace and takes her to West Manjipoor where she gets a taste of the other side of her Kingdom. Meanwhile, Diva raids the palace in an attempt to get the book. Alex senses a problem and returns for a showdown with Diva in which Caleb gets injured protecting Alex. Diva flees empty handed but now Caleb is working on the inside. Everything has gone according to her plan. Alex returns to Manjipoor to check on Caleb, who's still very hurt. Kuru doesn't like her being here with Diva loose but Alex won't leave until she has what Diva's after — the book. After magically revealing the book, Alex takes it and Caleb to her world for protection. Caleb is brought to the Taylor's Warehouse and although Taylor has questions about where he's come from, he agrees to let Caleb crash. Once Alex's magic has brought Caleb back to good health they are closer than ever. Caleb kisses Alex and she calls it a heat of the moment thing, but is surprised by the emotions it has stirred up in her. Between covering for Alex's "weird habits" and dealing with Veronica, Amanda helps Taylor see that he's better off without his ex. Even though Caleb is getting better, and is getting along well with Alex, she wants to cool off their relationship and doesn't think he should come to the band's gig. When Caleb suggests he'll return to Manjipoor, Alex doesn't object and he takes this as a sign that she feels nothing for him. Caleb begins to read the book but stops, aware of his choice between this or Alex. Veronica interrupts and brings him to the gig in an attempt to make Taylor jealous. It doesn't work. However, it does make Alex realise how strongly her feelings for Caleb are. As Kuru and Zamira spend time together, they return to their roots as best friends from West Manjipoor. But is that all they'll ever be? Desperate to know why Diva wants the book so badly, Alex plans a trip to Manjipoor but Caleb refuses to let her go without him. So Alex turns Amanda into her double, "Alex". "Alex" looks like the real Alex but inside it is really Amanda, who is tasked with keeping Caleb occupied. After "Alex" grills Caleb with questions about his relationship history, Caleb figures out who he's really dealing with and decides to have a little fun. But when things go out of hand "Alex" bails, losing track of Caleb. Meanwhile, Alex seeks answers about the book from Zamira, who is resentful toward Alex's Royal Family and of little help. Alex and Kuru go to the Elephant Temple Ruins and discover that the book is linked to the ruins and may contain the ways to control Dark Magic. They must protect the book so that Diva never gets it. Caleb's place in the Alex's world is distracting Alex from schoolwork and her band, so she decides it's best for Caleb to go back to Manjipoor. Before he leaves, Caleb secretly reads the book, but returns empty handed, which infuriates Diva. 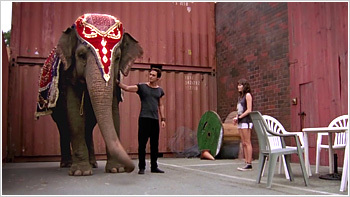 In an attempt to protect Alex, Caleb goes to the Elephant Temple ruins and performs a ritual to gain Dark Magic powers which grants him super strength. Caleb uses his new powers against the local gang, but it isn't until he sees them the next day that he remembers the fight. Caleb begins to wonder if he got more than he bargained for. 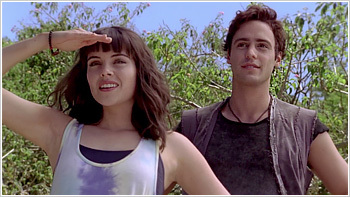 Without Caleb, Alex is distracted and struggles to study for her music theory exam. Amanda tries to help Alex focus but realises she belongs with Caleb. For their music assignment, bands must write an original song. When Veronica's group can't write theirs, she steals the recording of Alex's band's song, replaces her vocals for Alex's, and tries to claim it as her own. The truth is revealed and Veronica faces expulsion as punishment, but in an unexpected turn Alex begs the teacher to give Veronica another chance. Veronica still struggles to write an original song, until Alex puts their rivalry aside and helps her succeed. In Manjipoor, Caleb practices his Dark Magic, while Diva and Zamira begin to suspect he has feelings for Alex. Zamira tries to get closer to Kuru, in an attempt to get the book back to Manjipoor and in her reach. Zamira finds out that Caleb has been reading the book and gaining Dark Magic. Despite the great danger this puts them in if Diva found out, Zamira helps Caleb gain a new power — to jump between worlds. Caleb uses this power to secretly come to Alex's world and protect her from Todd, a friend of Veronica's who's interested in Alex. Though Alex is happy when Todd leaves her alone, she's completely unaware of Caleb's dark secret. Now Zamira plays the dangerous game of keeping the truth about Caleb from Diva, at a time when Diva's suspicions are rising. Note: I'm pretty sure Jessica Green, one of the stars of Jonathan M Shiff's next series, Lightning Point, appears as an extra. Look for her early in the episode after Caleb knocks the coconut out of the tree. In the next scene she walks through the foreground. When Caleb comes to the warehouse in secret to read the book, Taylor almost catches him. In an attempt to conceal his identity, Caleb transports Taylor to Manjipoor, where Taylor gets lost. Alex and Amanda are concerned when they can't find him anywhere. But it's not long before Diva captures Taylor and, upon finding out he's a friend of the Alex's, she tries to use him as a bartering chip to get the book. Alex goes to Manjipoor, prepared to make the exchange to save Taylor, but before she has to, Caleb discretely uses his powers to save Taylor. Caleb doesn't reveal his secret to anyone, but Diva is certain someone is using Dark Magic. Back in Alex's world, Taylor knows Alex's secret! After Caleb loses Taylor he goes to Zamira for help, and though she's frustrated by Caleb using his powers so carelessly, she tries to help Taylor, but only winds up in the middle of Diva's plans. Unhappy at spending so much time apart, Alex invites Caleb to live in her world permanently. Much to Kuru's concern, Caleb accepts the proposal. But Zamira insists on staying in Manjipoor where Caleb can't protect her from Diva. When Diva threatens Zamira's safety, Caleb uses his Dark Magic and not only reveals his secret to Diva, but that he's not scared of her either. Caleb can get the book, and uses this to gain power over Diva and keep Zamira safe. When Alex and Taylor get invited to Veronica's birthday party, Amanda is left off the guest list. After pretending she doesn't care, Amanda goes to the party as Taylor's guest, but Veronica doesn't make her welcome. While Alex gets excited about Caleb coming to live in her world, he is busy keeping his Dark Magic secret from her. Diva learns that Caleb has fallen for Alex and sends Zamira to tell Kuru about Caleb's secret powers. Caleb has betrayed Alex and when Kuru confronts him about this, a fight breaks out between the two boys. Seeing Kuru's injuries and hearing his suspicions gives Alex suspicions of her own about Caleb. Alex lays a plan and catches Caleb with the book, red-handed. Heartbroken by his betrayal, she sends Caleb back to Manjipoor. They're finished. Everything went exactly to Diva's plan, Alex is hurt, Caleb has nowhere to go and all that's left is for Caleb to bring them the book. Kuru now feels he can no longer be Alex's advisor and quits his job. When Alex tries to destroy the book, she finds that it is protected by magic. Unable to convince Caleb to help them, Diva begins a Dark Magic ritual, guided only by what Zamira can remember from reading the book in the past. It's a success; Diva gains Dark Magic, including the power to jump between worlds, and Kuru sees it all! While Diva storms the warehouse, seeking the book, Kuru confronts Zamira, hurt by her betrayal. Kuru learns what Diva's up to and goes to Alex's world with Caleb to fight. Alex puts up a good fight but her powers are no match for Dark Magic. It is Caleb who stops Diva from killing Alex, but his efforts don't redeem him for his betrayal. Diva returns to Manjipoor with the book where she and Zamira claim the palace. With nowhere else to go Caleb stands by Zamira, but he doesn't like this at all. Kuru convinces Alex it's pointless going after Diva without the book. Alex accepts it for now, but this isn't over. Despite Diva's reign of the kingdom, Alex goes to West Manjipoor to visit Kuru. As they can't beat Diva, they try to cut her power off from the source — the vault. But even with magic, Alex can't close it, nor can she convince Kuru to come to her world with her. Life in the palace bores Caleb; he returns to Alex's world and runs into trouble with Taylor. 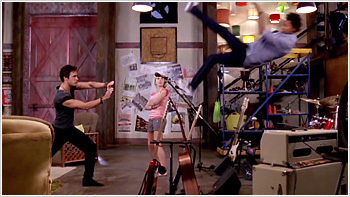 In a heated moment Caleb uses his powers against Taylor and Veronica sees! They have a hard time explaining it. When Alex finds out Caleb's around she makes sure he knows that she wants nothing to do with him. Just as the band are looking forward to their gig, Alex, Amanda and Taylor find out the club is closing down and they've lost their only place to play. Seeing how important it is to Alex, Caleb uses Dark Magic to conjure up money and becomes an investor in the Canal Club. The band get their gig back! But Alex won't play for him, not when he's using Dark Magic and risks exposing their secrets. Instead, Veronica and her group get the gig they've always wanted and Alex spends some time with a friend in need. When Caleb uses Dark Magic to give himself incredible guitar skills, Veronica is quick to recruit him for her music. Once again, Alex is disappointed in Caleb for using Dark Magic publically as he could expose their secret. Caleb apologises and is about to quit Veronica's group, except when Veronica videotaped their rehearsal she recorded footage of Caleb using his Dark Magic to disappear. She makes it very clear that if he quits on her, everyone will know his secret. Afraid it'll lead back to her, and Manjipoor, Alex helps Caleb out of this mess. At Veronica's gig, Alex, Caleb, Amanda and Taylor work together to destroy the footage of Caleb disappearing and completely turn the tables on Veronica. It's Amanda's birthday so Alex and Taylor are planning an awesome surprise party, which leads them to lie to Amanda. Amanda thinks they've forgotten her birthday until a great surprise which leaves her ecstatic. But the party is crashed by Zamira who has some unsettling news… After too much time spent reading the book, Zamira is going to call it quits until Diva tells her that Alex's mother killed Zamira and Caleb's mother. Full of anger at Alex and her Royal family, Zamira goes to the Alex's world to get Caleb. The first person she meets is Veronica, whose suspicions about Caleb are rising. Veronica leads Zamira to Amanda's party. After the new revelation about their mother's death, Zamira expects Caleb to cut all ties with Alex, but he doesn't believe what Diva told Zamira and sides with Alex. Zamira goes home with more anger at Alex and the Royal family than ever. Zamira comes to a section of the book that is blocked by the Royal Seal. Unable to get past it without a Royal, Diva plans to force Alex to read it for them. Diva gives Senq (a West Manjipoor thug) and his gang Dark Magic powers to help her mission in Alex's world. Veronica is gathering more suspicions about Alex and Caleb and is happy to oblige when Diva arrives, wanting help getting to Alex. Veronica thought she'd get answers from Diva, but instead gets a dangerous showdown in her backyard. When Alex refuses to help Diva, Caleb comes to save her but gets hurt in the process. Caleb recovers and it looks like he and Alex are growing closer again. Still unable to make progress reading the book, Diva sends Senq to bring Kuru to the palace to see if he can be of use. Upon learning that Kuru is being held against his will, Zamira helps him escape the palace and Caleb helps him escape Senq. On a mission to get the book back before Diva can read any more of it, Alex runs into Zamira and reads the blocked section of the book. the book plays a flashback, which reveals the truth that Diva killed Zamira and Caleb's mother. Diva confirms this and although Zamira will never help her again, it's too late, Alex has unlocked the book for Diva. Dealing with Veronica's suspicions about Alex and Caleb is becoming a very difficult task, but Amanda and Taylor do their best. After leaving Diva's fold, Zamira is reluctantly in Alex's world and still at odds with Alex. Determined to learn the truth about their mothers, Zamira works with Alex, who, with Kuru, uses her magic to observe Zamira's memories. The truth is that their mothers were good friends who worked together, and Zamira finally stops seeing Alex as the enemy. When Veronica secretly records a conversation between Amanda and Taylor about Alex's secret, she plans to put everything she knows on the internet. Instead of letting Veronica tell the world, Alex tells Veronica the whole truth, and Veronica has to believe it when she meets Anala! When Zamira and Kuru return to life in West Manjipoor, Zamira is threatened by Senq and Caleb feels he needs more Dark Magic to protect those he loves. He begins the ritual to gain more power, but Senq causes Caleb to mess up the ritual, giving him more Dark Magic than he meant and much more than he can handle. Now that Veronica knows Alex is a Princess, she begins treating her like royalty. After Veronica decides to join Alex's band, Alex decides it's all too much and gives her the Royal direction to go back to the old Veronica… who isn't in their band! Unable to read the book herself, Diva plans to capture Alex to make Caleb read it. But when Senq is sent to get Alex, he takes Amanda as well. Caleb and Taylor realise the girls are gone and rush to Manjipoor to help them. While Taylor helps rescue Amanda, Caleb is helpless. He suffers from visions of a disturbance at the vault of Dark Magic and when he gets these flashes, he loses control. Diva's plan is foiled when Alex, Amanda and Taylor return home safely, no thanks to Caleb. Realising how worried Taylor was when Amanda was in trouble is just the push those two needed two take their friendship to the next level. The end of year music awards are on and it's a big deal when Alex asks Caleb to go with her — he promises not to let her down. But just as he's about to meet Alex he gets transported between worlds against his will and Zamira helps him see that this is the vault of Dark Magic controlling him. Despite his weakened state, Caleb goes to the palace, tries to seek answers from the book (to no success) and barely escapes Diva. Meanwhile, Alex goes to the awards night alone, her band wins an award but she can't get Caleb off her mind. Then, in an attempt to save Alex from more pain, Caleb tells her he can't see her anymore and he leaves for good. Knowing he's dangerous, Caleb goes into hiding and doesn't want to be found. But when Zamira and Kuru tell Alex that Caleb is a victim to the vault, she insists he needs their help. Caleb uses the last of his strength to protect Alex's friends from Senq, but has lost the power to jump when Diva takes him prisoner. There's no comfort for Caleb, not only has he lost control, but the vault is sucking life out of him as well. So what does Diva want him for? Diva begins returning Caleb's Dark Magic to the vault and Senq arrives in Alex's world to stop Alex getting in the way of Diva's plan. As Diva sacrifices Caleb to the vault, the barrier begins to break and Alex escapes from Senq to West Manjipoor quicker than ever. Alex arrives in time to see Caleb disappearing into the vault and Diva smiling in victory. But Alex won't give up. She throws herself into the vault after Caleb and destroys it from the inside. Caleb and Alex land outside while Diva is sucked back in, where she belongs and never to be seen again… But Caleb is lifeless. Was Alex too late? Just as Alex kisses him one final time, Caleb returns to life! the book is safely returned to the palace, where Kuru and Zamira are together at last, while Alex and Caleb go back to Alex's world and rock out at another gig.